While spiders are abundantly present all throughout the year, the highest level of visibility occurs in the Fall months. The main reason is, the process of “ballooning” occurs in autumn. This is when spiders climb onto various types of surfaces, and then create a silk-like thread that carries baby spiders in the wind to various locations. This gossamer is often highly abundant and may be observed in the air, on plants, and a wide assortment of other objects. There are various species of spiders. Most are relatively small and are not noticed; however, large species reside in gardens and try to make their way into homes. In this guide, you will learn about these creatures. The most commonly observed spider during autumn is the American house spider. These spiders are often observed within homes, sheds, garages, and other regions in or near structures. In most instances, these spiders will live, peacefully, with humans; however, if they feel threatened in any way, they are known to become aggressive. If you were to receive a bite from one of these spiders, you would likely feel a sting – much like that when stung by a bee. It is common for the affected region to become red and for swelling to occur. Typically, this is all that is experienced; however, there are some instances in which nausea and varying degrees of dizziness may occur. If these symptoms are experienced, medical attention will be required. 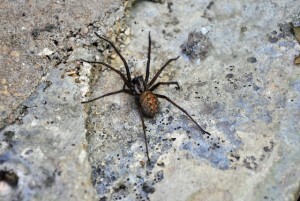 An infestation of this common house spider is most likely to occur at the end of summer or throughout the Fall months. This particular arachnid prefers to live in locations that are dark and moist. It is not at all uncommon to find them in attics, crawlspaces, and basements. When this type of spider selects a location to live, it will choose based on the location’s access to capture prey. When you see a cobweb made by the house spider, you will find that, most often, they are in corners high in a room, around windows, underneath furniture, and other locations. When working to eliminate the house spider, it is imperative that you treat these areas.